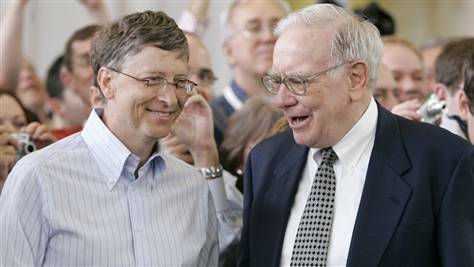 Bill Gates and Warren Buffet have teamed up and has decided to ask America’s wealthiest people to donate half of their fortunes to charity. They contacted 70-80 people on the Forbes Wealthiest 400 Americans list, only to come away with 40 others who agree. “We contacted between 70 and 80 people to get the 40. A few were unavailable. We don’t give up on them. Every saint has a past, every sinner has a future. We’ll keep on working,” Buffett said. Included in the 40 people are, New York Mayor Michael Bloomberg, entertainment executive Barry Diller, Oracle co-founder Larry Ellison, energy tycoon T. Boone Pickens, media mogul Ted Turner, David Rockefeller, film director George Lucas and investor Ronald Perelman. At givingpledge.org the billionaires gives reason as to why they agreed to follow in Bill and Warren’s footsteps.